CORPUS CHRISTI - The Hooks have earned the Texas League's nomination for the John H. Moss Community Service Award, presented annually to a minor league team for its commitment to charitable service and support within the community and baseball industry. "One of the telling indicators of a club's successful integration in their community is their commitment to good works," Texas League President Tom Kayser said. "The breadth of the Hooks giving in the greater Corpus Christi area is stunning. With the willing cooperation of the Houston Astros, the Hooks have long been known to involve their players in a wide range of wonderful causes. Additionally, the Hooks and their staff have worked with a variety of causes, organizations and institutions that has resulted in wide ranging benefits to untold numbers of area residents." 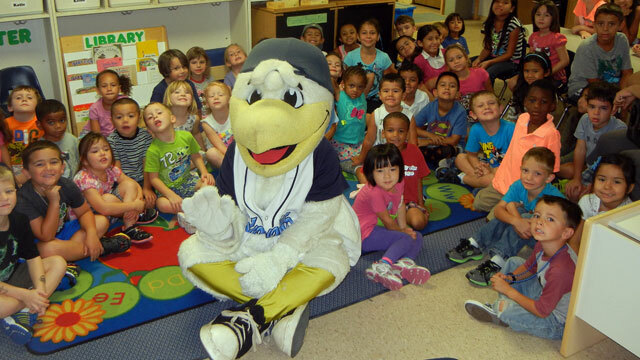 The team's oldest initiative is the Get Hooked on Reading program, started in 2004 and sponsored by Flint Hills Resources, which encourages children in grades one through eight to read during the summer months. The Stripes Diamond gives youth teams a chance to play at Whataburger Field. Located beyond the center field fence, the diamond has hosted over 540 squads, including 36 in 2014. The largest off-field baseball event in the Coastal Bend, the South Texas Winter Baseball Banquet serves as the unofficial "first pitch" to high school baseball each winter. The event features recognition for high school baseball and softball players, college baseball players, pros and a lifetime achievement award recipient. Growing year after year, the annual dinner attracted over 700 attendees in 2014. The community service award's namesake, John H. Moss, founded the South Atlantic League in 1957 and served as its president for 50 years. The Grand Junction Rockies earned the inaugural honor last season.